Which Electric Shower? – Types of electric shower. There are numerous different varieties of shower on the market, each suited to different hot water supplies and each giving a different rate of water flow. These include mixer shower valves, electric showers and power showers. For this guide, we shall be concentrating on the two systems that use electricity to heat or control water flow, Electric Showers and Power Showers. Though these systems may look similar, they do in fact do quite different things – it is important to be aware of these differences when choosing which electric shower is right for you. Electric Showers: These showers directly heat cold water from the mains. This makes electric showers comparatively economical as they only heat the water you need, and because electric showers are independent of your main hot water system they are the only shower system that allows you to have a hot shower even if your boiler breaks down. Electric showers do not use a pump to increase water pressure, so the flow rate you can expect depends on the mains pressure in your area. Power Showers: Power showers can be considered ‘electric’ showers because they have to be connected to an electricity supply in order to operate. They are very different to standard electric showers, however, as they do not heat the water they use. Instead, they are fed by both your hot and cold water supplies and use an electric pump to increase the water pressure. This makes them more powerful than most electric showers, but you’ll have to get used to freezing cold showers if your boiler fails. Power showers cannot be used with combination boilers or mains pressure cold water. Electric showers and electric power showers both have benefits and potential drawbacks. When deciding which electric shower to go for, consider which variety would suit your water system, and whether you prefer a strong, invigorating shower or a gentler, more relaxing showering experience. MBD Bathrooms supply the ‘Aqua’ range of electric showers by Galaxy Showers, along with their ‘GL’ power shower range. They also offer an innovative combined model – the Aqua 9000XP – that feeds only from the cold water supply but provides the water pressure of a pumped power shower. Require plumbing to the mains cold water supply only. Need to be connected to an electrical supply – high power (between 8.5kw and 10.8kw) electrical elements must be connected to a separate fused electrical supply circuit. This usually requires an electrician. Require plumbing to the household hot and cold water supplies. Need to be connected to an electrical supply but use much less electricity than an electric shower. Electric showers and power showers have something of a reputation for limescale build-up in areas that have hard or mineral-rich water. Thanks to innovative features available on selected Galaxy Showers, however, mineral build-up no longer poses a significant problem for today’s electric showers. 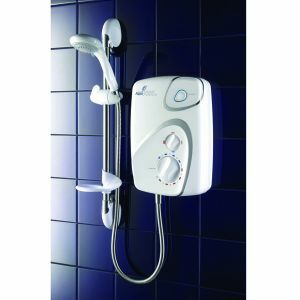 If you do live in a hard water area, and are unsure as to which electric shower to buy, consider the Aqua 3000si or 4000si models in our range, which include features such as Scalemaster Protection and Phased Shutdown; these features combined can significantly reduce limescale build-up and increase longevity. Scalemaster showers work in two ways. They include specially coated heating elements that prevent particle adhesion, and an electrolytic inhibitor which changes the size and shape of limescale crystals, reducing their adhesive properties. Phased Shutdown is a feature that allows the shower to flush out any water still left in its system. This prevents water from sitting dormant over important parts of the shower such as the heating element, and greatly reduces the risk of limescale. The Aqua 3000si and 4000si models are both Guaranteed for two years against limescale build up and manufacturing faults. To save yourself the hassle of dealing with an installer/electrician who isn’t qualified for the job, consider contacting a professional who is a member of a self-certification scheme such as the British Standards Institution. An important factor to consider when dealing with an electric shower installer is whether or not they will provide a BS7671 certificate when the work is complete; this certificate proves that electrical work has been carried out safely and is essential if you want to sell your house. We supply electric showers only from Galaxy, because we know from experience that they offer performance, reliability and an aesthetic appeal that is difficult to match. Combine this with MBD Bathrooms’ unbeatable prices and the result is the best balance of quality and affordability you will find anywhere in the UK. That’s why we believe that the answer to the question ‘Which electric shower?’ is simply, ‘A Galaxy shower from MBD Bathrooms’. Temperature stabilisation on all electric showers. Scalemaster limescale protection on certain models. Phased shutdown on certain models which helps reduce limescale. Adjustable handset with five invigorating spray patterns available. 7.5kw, 8.5kw or 10.5kw options. Available in white, chrome or satin chrome. All models of electric and power showers from Galaxy come with a two year guarantee against manufacturing faults, with Galaxy’s aftercare maintenance team providing a home repair service. The ‘Si’ models come with the standard guarantee against manufacturing faults, with the added benefits of two years of cover against limescale build-up. The Nova brand of shower valve from Galaxy comes with a one year guarantee. If you have any more questions about electric showers, just call us – we’ll do our best to help.